Who says that 3D printers are only for making small objects such as toys, spare parts, and chess pieces? Artist Joris Laarman and several others are changing this philosophy. Laarman, who is a world renown artist, uses 3D printing in much of his work. He currently has an exhibition at the Friedman Benda in New York City. The exhibition features many of his elaborately designed furniture pieces, including a bench and some chairs that have been 3D printed, using Laarman’s MX3D printer (MX3D-Metal). The MX3D-Metal is a robotic arm that prints using stainless steel and other metals. The patent-pending robotic 3D printer is not anything like traditional 3D printers. It prints in mid-air, drawing lines in space, which at times create some incredibly complex designs. Laarman has already generated interest from many large corporations, including construction companies and shipyards. The MX3D-Metal is responsible for creating the Dragon Bench (seen below), which is a 12×8 foot gigantic bench. This is one of the pieces on display at the Friedman Benda. Many of Laarman’s other chairs and tables at the exhibition also are created with the help of 3D printing. He has been utilizing 3D printing to design and fabricate chairs since 2006. Laarman however, doesn’t rely solely on his MX3D-Metal for the design of all of the chairs in the exhibit. CNC systems, robotics, and parametric software also go into the equation when creating these works of art. The latest and perhaps ‘greatest’ new chair that has been created by Laarman and his Bitsandparts spinoff project, is the Makerchair. The Makerchair is a 3D printable chair, that was designed with the help of crowdsourcing, and is consider to be the first “crowd fabricated” chair ever made. It was generated out of 202 3D printed jigsaw puzzle pieces, and can be printed on most 3D printers. Laarman is currently allowing anyone to download the design files for the chair, so that they can print it out at home. 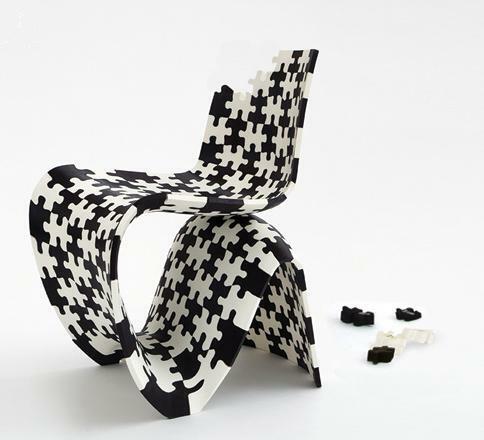 Once printed, the jigsaw pieces can be assembled to create a real, standard sized chair. Because there are so many pieces, the chair can be printed on just about any size FDM based 3D printer, such as a Makerbot, Ultimaker, RepRap, etc. It has also recently been improved upon and now only consists of 77 parts, rather than the original 202. Laarman estimates that it will take about 10 days to completely manufacture, and will cost about $30 in supplies. Check out the video below for more details on how this chair is created.